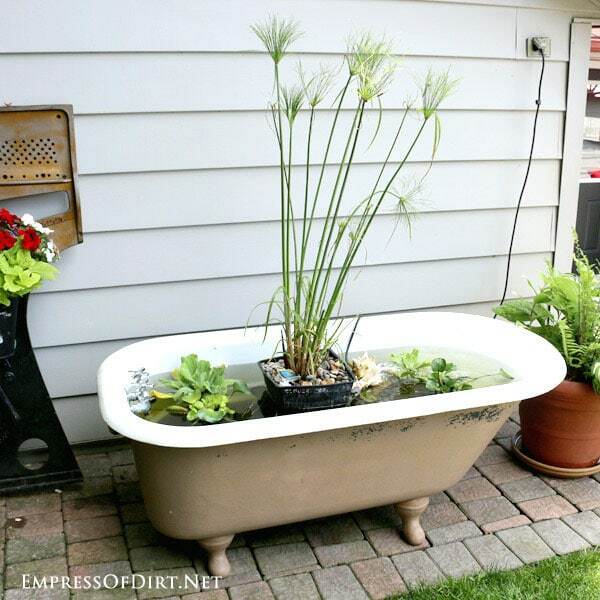 Old claw foot bathtubs can easily be converted into wonderful container garden ponds. I’ll show you the supplies needed and how it’s done. 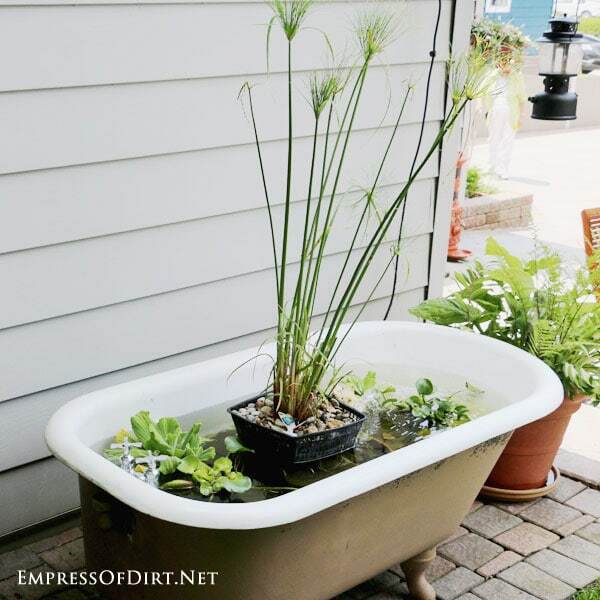 If you’d like to start a small in-ground garden pond, see: Backyard Pond Tips including a gallery of fish pond ideas. I’ve been wanting one of these ponds for a while and I’ve got my local junk shop owner on the lookout for an old bathtub at the right price. While many people love the idea of restoring an old claw foot tub for an indoor bathroom renovation, the downside is that old tubs are not insulated and don’t retain heat well. 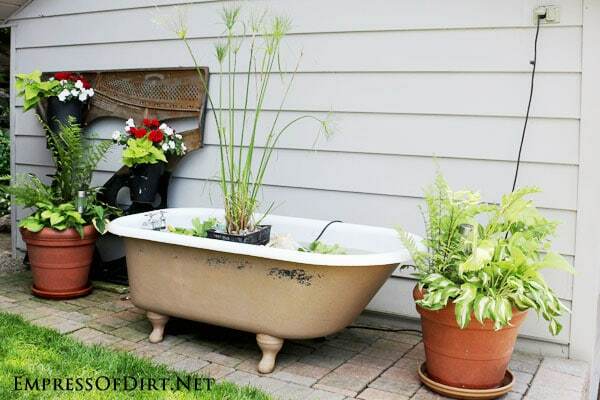 Personally, I’d rather take the old tub outdoors and repurpose it into a water feature. I saw this little pond on a local garden tour. It’s from the same wonderful gardener who created this Bed Frame Veggie Garden. Any water project can pose a risk to humans, pets, and wildlife. Do not add any water feature unless you are certain it’s legal and safe. Some links go to my affiliate account at Amazon.com. I always suggest you try and buy locally or better yet, get stuff free and repurpose it. It really doesn’t have to have claw feet. Just pick something you like. And keep in mind that a slippery container like a tub is best kept above ground so small animals and rodents don’t fall in and drown. If there’s any chance wildlife will use the pond, please research safety considerations. A recirculating pond pump and filter. You can see one here via my Amazon affiliate account. You’ll need to estimate the water volume of the tub and choose a pump appropriate for that volume of water. They are sold by ‘gallons per hour’. If your tub holds approximately 50 gallons of water, you’d want a pump that circulates 50-100 gallons per hour. This will allow extra strength to power a small waterfall or spray feature. Small pond pumps usually come with small sponges inside that gather gunk as the water circulates. 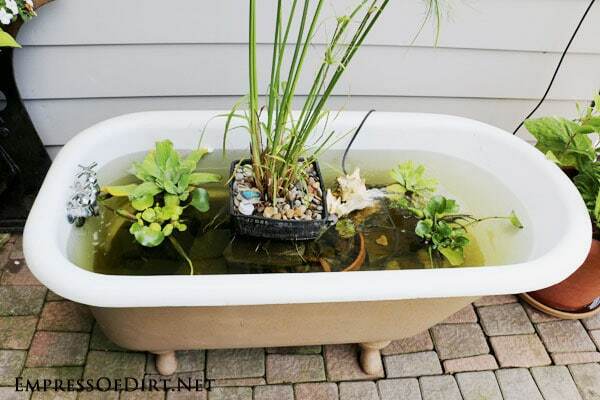 Once the pond is established, you may have to clean them every day. A better solution is to use my chemical-free pond filter method—free instructions are here. Some pond pump kits come with extra gadgets like bubblers or fountain sprays. Check that the pump you’re getting comes with the attachments you want. Outdoor GFCI (Ground Fault Circuit Interrupter) electrical outlet. Don’t mess around with this. If you don’t already have one near the pond location, get a certified electrician to install a proper GFCI outlet that meets all the code requirements in your area. Plugs or other materials to close up drain and overflow holes. Decide whether you want to close up the bottom drain hole and overflow holes temporarily or permanently. If you’re lucky (or have a good plumbing store nearby), you’ll find plugs that fit snugly in both and do not leak. Otherwise, ask at a plumbing shop for a product they recommend for this purpose. Some sealants work in sitting water and others do not, so you need to make sure you choose a marine grade product. Another option is plumber’s putty. Hardy water plants will survive as well if they never get frozen solid. Tropical pond plants would have to be stored indoors if you live in a cold climate like I do.You won’t need a lot plants: they do multiply quite readily each growing season. 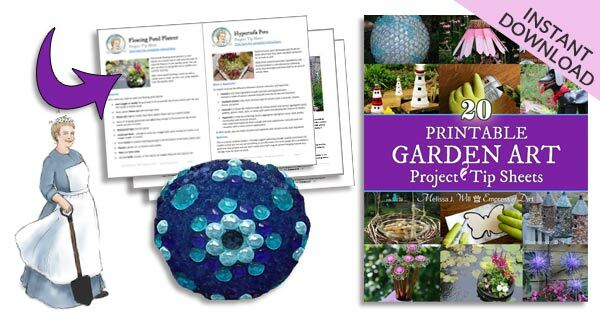 Shop at a favourite garden nursery, tell them what your project is, and they can help you pick the best plants based on what’s available in your area. Or, ask a friend with a pond if they have any plants ready for dividing. Fish need lots of room to have a healthy happy life. You could have just a few cold-water goldfish in a 50 gallon tub if there’s room to swim without too many plants in the way. But don’t add them if you’re not sure. 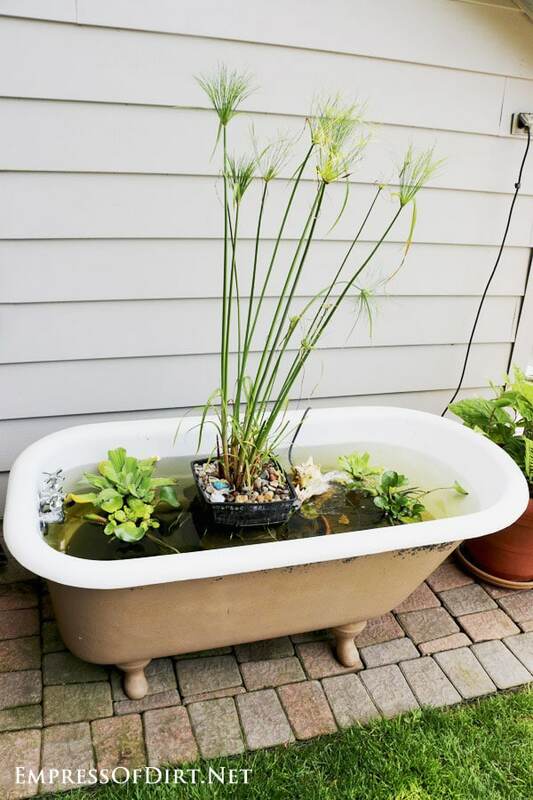 It’s also easier to care for the tub in the winter if you’re not worrying about keeping the fish alive too. This shows how to estimate how many fish you can have in your pond. Bricks or other materials to hold plants at required level. Each type of aquatic plants has a prefered planting depth in the water. Use bricks to ensure the plant containers sit at the right height. If your pond will be in a fairly sheltered area (where the wind won’t get it), it’s really sweet to devise a recirculating spray of water from a shower head. You may need an extra pump dedicated to this with some tubing to run the water up through a pipe to the showerhead. If this idea is making your head hurt, just ignore it. Your pond will still be really sweet. Faucet handles are a sweet touch to keep the bathtub theme going (rather than having the mount holes exposed). Your pump filter may need rinsing out on a daily or weekly basis to keep the water flowing nicely and avoid straining the pump. Remember, my handy trick for a sparkling, clear pond is here in case you need it. The aquatic plants may need to be lowered in the water as they grow. If you live in a cold climate, tropical plants will need to be stored/”overwintered” in a garage during the winter months. Hardy plants can survive most winters if they are placed at the bottom of the tub and the pump is kept running to ensure the water never freezes. Thank you for your posts….they are very informative. We are wanting to set up a bathtub water pond on our property. We will not have 110v power to the area we want to put it so we want to use solar. The tub holds approximately 50 gallons. I would also like to put a couple small goldfish in it to eat bugs/larvae. The problem I see with solar is that the pump will run during sunny days, but not at night or during cloudy days. We have even had problems finding a battery that will carry the pump overnight. Is this a problem with a couple gold fish in it? Can they go for periods without the water being pumped which helps add aeration? Thank you for your help. I have not had good luck with solar pumps but it has been a few years since I tested them. Perhaps there are newer ones that store some energy in batteries for later use? I would not have fish without proper water circulation. Yes, they could survive but it’s not considered a kind environment. Also, it’s quite a small space unless you’re just hosting a couple of fish. Wish I could sound more hopeful, but without the electric pump, I wouldn’t do it. Thanks Melissa for your thoughts. Iagree with you, but sure would be nice to have it all, lol. This is genius. 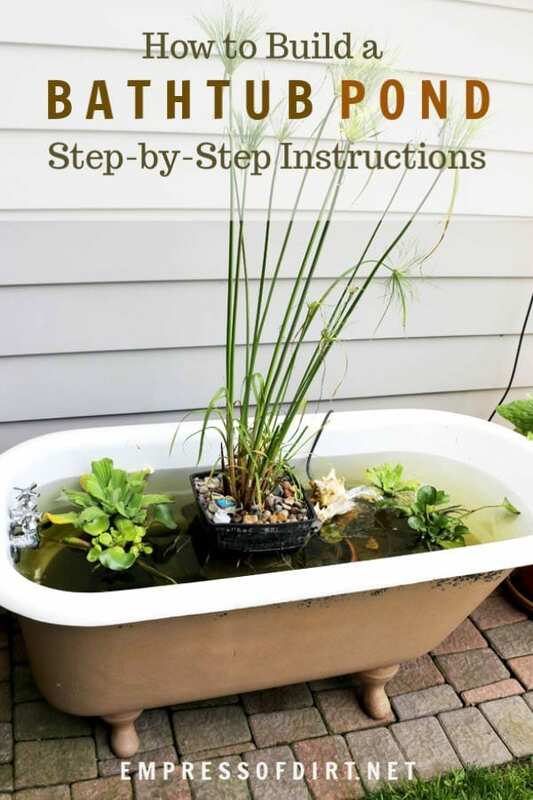 It makes having a pond possible for all those people (like me) who want one but don’t want to go through all the steps involved in actually adding an in-ground pond. What an innovative way to re-use a clawfoot tub! Thanks for sharing.